Dake Bible Discussion Board ⇒ CHILDREN ARE INNOCENT AND GO TO HEAVEN IF THEY DIE. Re: CHILDREN ARE INNOCENT AND GO TO HEAVEN IF THEY DIE. Dake did, indeed, consider that Jesus spoke of real people when He spoke of Lazarus and the Rich Man. Dake took it as no parable, but as actual events that happened in actual places. Do you really think that men in hell will be able to talk to anyone in heaven? Jesus was making a point, not an observation. In Rev 5:24, we see..."And Enoch walked with God: and he was not; for God TOOK him." As God would be in heaven, the scrip' would need to say..."...for God SENT him" , if paradise and heaven were different places. That's not what Revelation 5:24 says in my Bible. There is no Revelation 5:24. Adding to the book of Revelation is said to be quite dangerous. "For I testify unto every man that heareth the words of the prophecy of this book, If any man shall add unto these things, God shall add unto him the plagues that are written in this book: and if any man shall take away from the words of the book of this prophecy, God shall take away his part out of the Book of Life, and out of the holy city, and from the things which are written in this book." You're right...I meant Genesis 5:24. Therefore, Enoch did not become the prisoner of him that had the power of death whom Jesus destroyed: the devil. Paradise was held in captivity by the devil. You will need to supply a scripture claiming that. Besides, men of the OT could be made clean by adhering to the Mosaic Law; paying the penalties for sin with bulls and goats, etc. No. They could not. If adhering to the Mosaic Law could have accomplished that, then Jesus' death, burial, and resurrection was unnecessary. If you are correct, then the Day of Atonement and every other sacrificial rite was a waste of time. They could be made clean under the Law, but as men of the flesh they could not be freed from sin. They needed to keep coming back every year with more sacrifices for their new sins, while we have been freed from sin and need no further atonements. Without the Law's atonements, none of the OT people would ever be counted worthy of eternal life. Apologies for not responding sooner. Been extremely busy, offline. The Day of Atonement and the other sacrifices were not a waste of time. They were prophetic in nature. Hebrews 10:4 says that "it is impossible that the blood of bulls and of goats should take aways sins." The Old Testament sacrificial system foreshadowed Christ's crucifixion. I didn't say that anyone in Hell would be able to talk to anyone in Heaven. That said, since those in Hell are tortured in the presence of the Lamb, it would make sense that it is possible for communication if those in Heaven are also in His presence. Jesus clearly represented that communication across the Great Gulf between Hell and Paradise was not only possible, but occurred most clearly. Hebrews 2:14 says Jesus, through death, destroyed the devil (who had the power of death). Hosea 13:14 promised that Jesus would ransom those held prisoner by the power of the grave and redeem them from death. In other words, rescue them from the devil. If Enoch died, God did not take him. The devil did, as Jesus had not yet retaken possession of death. This took place after the death of Moses. 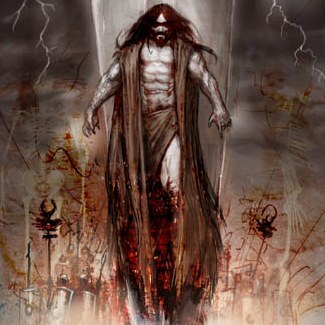 The devil had the power of death until Christ conquered him on the cross (Col. 2:14-17; Heb. 2:14-15; Rev. 1:18). The devil claimed Moses, but God intervened and took the body, burying it in the land of Moab (Dt. 34:5-6). If he has been resurrected it had to be after the resurrection of Jesus who is the firstfruit of all that have died (1Cor. 15:20-23). Whether Moses came out of the grave with the saints after Christ was resurrected is not stated (Mt. 27:52-53). He was in soul form in Mt. 17:1-8. — Dake's Annotated Reference Bible: Containing the Old and New Testaments of the Authorized or King James Version Text. The scripture references that Dake gives are interesting. Personally, I think it is more likely that the Lord raised Moses from the dead and that Moses was in bodily form, like Elijah, at the Mount of Transfiguration; the two together being a picture of death, resurrection, and rapture (with and without death; even though neither had, as yet, received a glorified body). No problem...it's been really slow here lately. But they WERE days of atonement, so they must have atoned for something...right? Yes, indeed, they did foreshadow our NT atonement and His blood for the washing away of sins past. I get the impression that the OT atonements were a pay-as-you-go system. Knowing that permanent repentance from sin was unavailable in the OT, continued atonements were a necessity. Men payed for their own sins monetarily, as it was all they had at the time. It reminds me of the catholic way...sin and confess endlessly without knowledge of permanent repentance from sin. They have taken atonement into their own hands instead of really being sorry enough for their sins to never commit them again. Then you ARE saying it. Please supply the verses you use to say that the sufferers will be in the presence of the Lord...thank you. He did, but the context was a parable meant to teach a lesson...not an observation. Why would the dead, good or evil, deal with Abraham instead of directly with God of His Son? Perhaps this misunderstanding is what led the catholics to start praying to "saints" for intercession? 1 Cor 15:55-56..."O death, where is thy sting? O grave, where is thy victory? The sting of death is sin; and the strength of sin is the law." The power of the grave is sin. Your "other word" are right only in this context...the devil foments sin. If we have been ransomed from the grave-sin we are also freed from the devil. He didn't die, as "to walk with God" infers obedience to God. Look at Jesus' words in Matt 10:28..."And fear not them which kill the body, but are not able to kill the soul: but rather fear him which is able to destroy both soul and body in hell." If the devil has "possession of death", Then Jesus is in error. I will get back to you concerning the rest of your post later, as I am called away right now. This took place after the death of Moses. The devil had the power of death until Christ conquered him on the cross (Col. 2:14-17; Heb. 2:14-15; Rev. 1:18). The devil claimed Moses, but God intervened and took the body, burying it in the land of Moab (Dt. 34:5-6). If he has been resurrected it had to be after the resurrection of Jesus who is the firstfruit of all that have died (1Cor. 15:20-23). Whether Moses came out of the grave with the saints after Christ was resurrected is not stated (Mt. 27:52-53). He was in soul form in Mt. 17:1-8. I seem to learn something new everyday. As for "soul form"? I have never read of such a thing by that name in scripture. If Peter thought he should build shelters, don't you think he was looking at "bodies"? God is the God of the living...we are told. When ever I encounter something like this conundrum, I am reminded that with God there is no "time", per-se, so He can send men who, to us, were dead for hundreds of years but are alive with God in our "now" scope of understanding. Thanks again for providing the scriptures rev Dake based his ideas on.